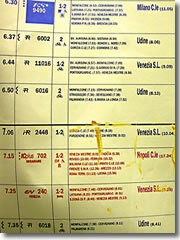 For train schedules and ticket prices in Europe, see the Websites of Rail Europe (www.raileurope.com) or the that of the German rail system (which also contains info on trains all across Europe) Bahn.de. Some trains still have the old-fashioned couchette configuration: Each car has a corridor along one side, lined with windows on the outside and doors on the other. These doors open onto 10 little couchettes, or compartments, which seat six to eight people (or, in first-class compartments, four to six people in slightly cushier chairs—but that's not worth the added expense). Sadly, most short-run trains and new highs-speed long-haulers are increasingly switching over to the modern straight-through cars with seats running down both sides of an open aisle. These always make me feel more like I'm at home commuting to work than traveling in Europe on a grand tour, but hey, that's progress for you. 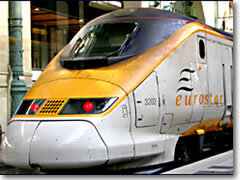 These trains include specialized and expensive high-speed trains within nations (France's TGV, Italy's ETR/Pendolino, Spain's AVE, Germany's ICE ), as well as international high-speed runs with fanciful names (Thalys from Paris to Brussels; Artesia from Paris to Torino and Milan in Italy), and the Eurostar, which started life just as the company behind the Chunnel trains that zipped back and froth through the the Channel Tunnel, but now runs many of the major long-haul trains across Western Europe. 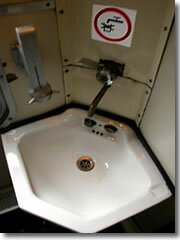 One final note before we get into the Eurostar: Don't drink the water on trains , not even to rinse your mouth. It's greywater meant for hand washing only. This is a bit frustrating, since trains—especially overnight trains—dehydrate you quickly. So make sure you bring bottled water to sip throughout the ride and also to rinse out your mouth (and your toothbrush) after an overnight train ride. I'm not going to provide specific prices here because (a) they are seasonal (and I don't know when you're traveling), and (b) there are more than a dozen price categories with weird names like "Leisure 3," "Premium," "Flexi Standard," "Leisure Flexi 1," "Business Value First," and "Leisure Day Trip." Unfortunately, there isn't a category called "Cheap." London's glorious Victorian redbrick castle of St. Pancras is right next-door to King's Cross Station, home to the famous platform 9-3/4 where Harry Potter used to catch the Hogwarts Express—a perfect sightseeing excursion when you have half an hour to kill before your train (track 9 and 10 are actually in a seperate shed from the main station, and sadly there's no real barrier between them, but the station has thoughfully labelled the wall at the back of the shed "Platform 9 3/4" and embedded a luggage cart in the wall). Have a full hour to spare? On other side of St. Pancras is the woefully under-visited British Library. In London, Eurostar trains arrive and depart from St. Pancras Station (www.stpancras.com; see sidebar; until November, 2007, the train used Waterloo Station, so make sure you're not using an outdated guidebook).